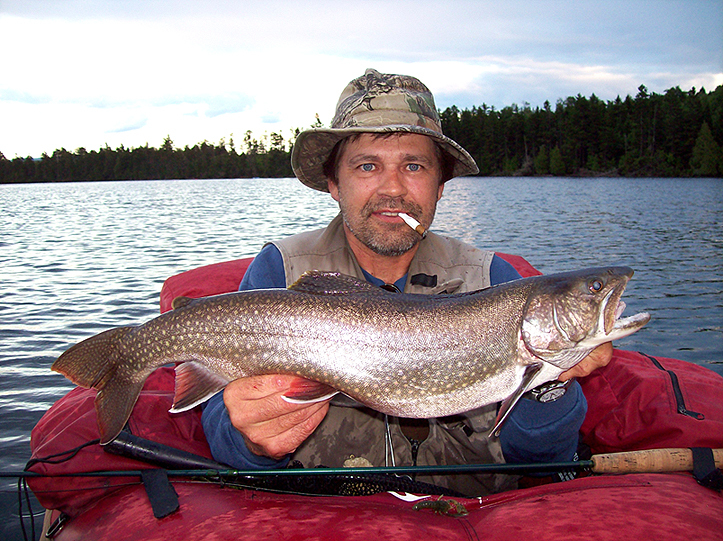 Splake are a hybrid trout resulting from the cross of brook trout and lake trout. The nearest fishable populations can be found in ME. NH has discontinued stocking them. While some consider them to be a Frankenstein fish, I find them to be another game species opportunity and the state of Maine finds them to be an important management tool. I have never caught one and would like to check them off my 2008 to do list. This year I plan grabbing my boat and heading to ME and making an attempt or two at this species this spring. I hope to add my own pics to this page soon, so check back. Below is some info I found on this species. The splake has been in production since the early 1870's. Reproduction has only occurred and been documented in hatcheries. 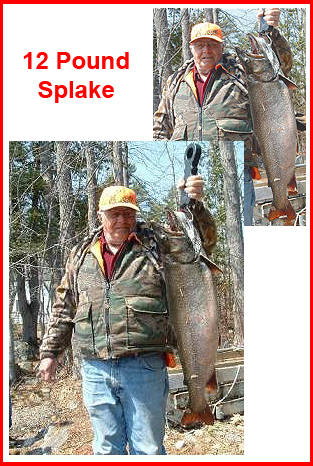 Splake have been introduced into a variety of waters in the U.S. and Canada over the past 100 years. Even with such a large distribution, there is no credible documentation of splake reproduction in the wild. Splake have demonstrated several attributes that suggest they can out-perform stocked brook trout in many Maine waters. 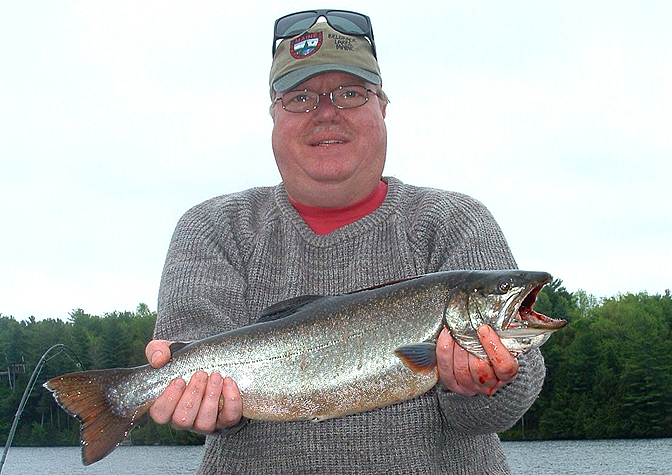 Splake have displayed a higher percentage of survival to age III, greater returns to angler's at large sizes, and the ability to utilize rough fish as forage in waters where competition limits brook trout growth. Splake can greatly enhance the diversity of opportunity available to anglers in the State of Maine. Data collected from study waters comparing spring yearling splake to spring yearling brook trout are conclusive. Splake have out-performed hatchery brook trout in all study waters. Quality fisheries, in terms of both size and catch rate, may be achieved in many waters where currently there are no active stocking programs or where hatchery fish are providing poor or marginal results. They have demonstrated several attributes that suggest they can out-perform stocked brook trout in many Maine waters and have displayed a higher percentage of survival to age III, greater returns to angler's at large sizes, and the ability to utilize rough fish as forage in waters where competition limits brook trout growth. The splake's unique ability to feed on rough fish, such as perch and bass, is also well documented. Using splake for management in this way can also be a valuable tool for fish managers. Managers must use the best possible science when stockingthem in fragile watersheds to help control or eliminate unwanted species. The splake provides fishing opportunity where none had existed before, while protecting the genetic integrity of Wild and Native Fish. Adult Size: In Maine, splake typically range in size from 10 to 18 inches. Splake grow at a faster rate than either of its parental species. They can attain lengths of 18 inches in just 2 years after stocking. Splake over 10 pounds have been caught. Identification: Splake and brook trout have very similar coloration patterns, making it very difficult for the untrained eye to distinguish between the two species. 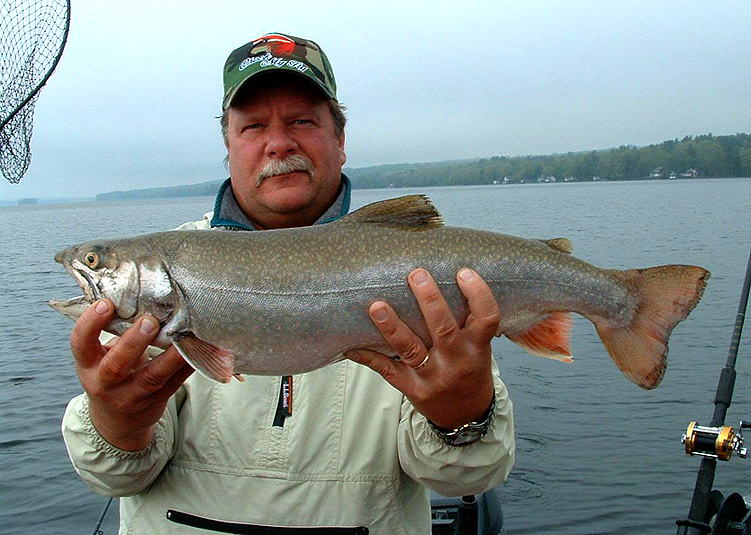 Splake tend to have a slight fork in the tail, a trait passed down from its lake trout parent, while brook trout tend to have no fork or "square" tails. In 1990, the Department of Inland Fisheries and Wildlife began a pilot program to determine if splake could provide acceptable fisheries in waters where stocked brook trout had failed and this program still continues today. Maine currently has approximately 53 waters managed primarily for splake. Fourteen of these waters are in the General Management category, 29 are in the Quality Management category, and 10 are in the Trophy Management category. 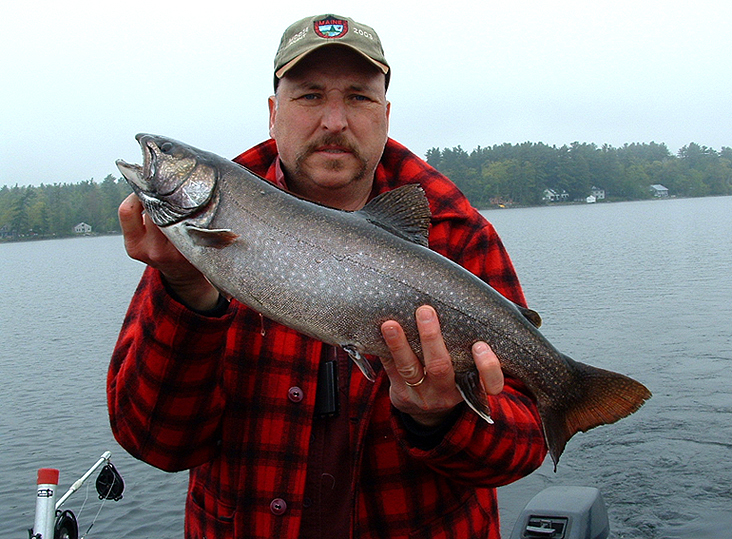 The world record splake was caught in Ontario and weighed 20 lbs. 11oz. Below are a few pics a ME outfitter was kind enough to send me. Photo Courtesy of Maine Fish and Wildlife. A specimen of 12 pounds, caught by Jake Knox.